Katherena Vermette’s debut poetry collection, North End Love Songs, won the 2013 Governor General’s Award for poetry. Her debut novel opens in a place locally known as The Break, a barren strip of hydro land in that same Winnipeg neighbourhood, as the sole witness to a violent crime recounts what she saw to police. As police piece together the events that led to the sexual assault of a 13-­year-­old Métis girl, the community makes a reckoning of its own. Through the voices of Emily’s friends, relatives and one of the investigating police officers, Vermette poses questions about the cycle of violence, the meaning of survival and the weight of history. Vermette and I talked by email about her complicated relationship to the place she calls home, the transition from poetry to fiction and the multi­generational impact of trauma. CHRISTINE FISCHER GUY: Congratulations on the publication of your first novel and belated congratulations for winning the 2013 GG for your first book of poetry. How have you found the transition from poetry to fiction? 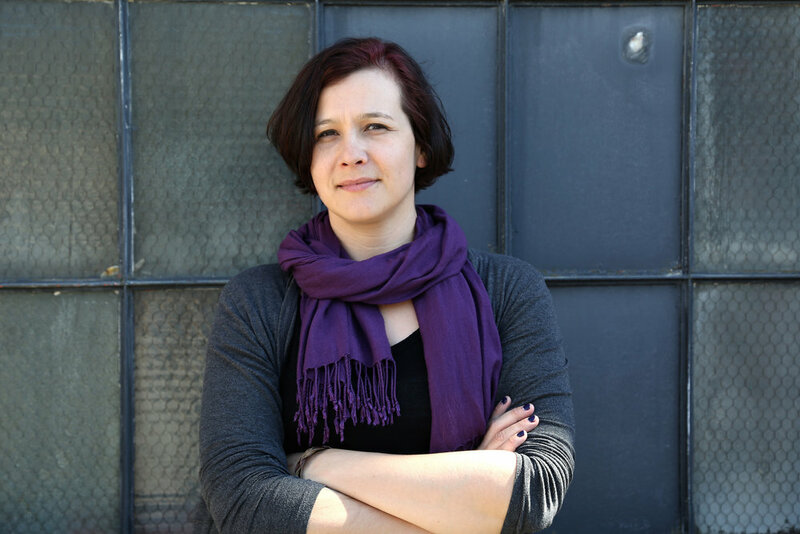 KATHERENA VERMETTE: I've always gone back and forth between poetry and fiction. Different stories call for different genres. I'm pretty sure this novel was the hardest thing I've done, but maybe writers just feel like that about their newest work. The poetry book was incredibly hard, too. Novels are so big and cumbersome. It felt like there were a lot more technical things to manage to make it all make sense. I did this a fair bit with the poetry collection, but this felt like the poetry collection super­sized! It took a long time to stitch it all together. On top of that writerly stuff, this was a very hard, emotionally gutting story to live inside for as long as I did. It's a sad story, a rage-­inducing story, and I haven't quite figured out a way to write about things and not be deeply affected by them. I've heard of writers doing this, but I don't or can't. These characters affected my core. CFG: How long were you writing The Break? KV: It's hard to say how long I've been writing this. The central story idea and some of the characters have been with me for years. They stuck with me as I figured out how to write it all properly. I wrote a few short stories on this during my MFA, and then developed them into a novel after. So the short answer is, the novel itself took about two intense years, but these girls and women have been living with me for years. CFG: It makes sense to me that you’d be deeply affected. Like North End Love Songs, The Break is also set in Winnipeg’s North End, and it continues to explore your complex relationship with the place and people that you call home. You’ve said that relationship was “complicated.” Has this novel brought you any closer to resolving those feelings about it? KV: In the poetry book, I call my relationship with the river “complicated” and I guess the neighbourhood and I are kind of the same. But like many "complicated" relationships in their longevity, I have accepted my companions for their gifts. I love my neighbourhood. I love and am proud of being from where I am from. There are situations, stories and elements that hurt, but as much as I see the issues, I see the solutions. I see people working every day to make the world better. That heals. I have always had hope, but as a younger person, that was sometimes a struggle. One thing this book really helped me resolve was to live in hopefulness. Even in the worst circumstances, you can still have hope. CFG: The Break explores the harsh realities of the North End and paints a portrait of a community turning on itself as well as one strengthening its ties. That creates an interesting tension that propels the story. When did you know that the assailant would come from within the Indigenous community? KV: I always knew who it was. The seed of this came from one of those mysterious writerly happenings — a dream or vision, nightmare really about the violent incident that Stella sees in the first chapter. In my dream, I saw both the victim and the perpetrator and their whole lives, too. I have known violence happens but never knew how someone could do that. That's where I started, with how. A shaking my fist at the sky sort of — how can someone do this?! I don't know if I really found an answer. I don't know if I or anyone can ever really know what makes a person commit violence. What I do know is that the violence that happens in someone, anyone, isn't divorced from the violence that has happened to that person. When someone lives in violence, it becomes normalized, to some extent, and sometimes they respond to violence with violence. It's a tragedy that begets more tragedy. And I didn't want to tell that story in isolation. What's more important than the how or why it happens, is how we survive, how these women and girls get through and end the cycle. I see more strengthening than turning myself. CFG: There is a quiet strength that comes through the tragedy in this story in the uniting of family and community. There are also hard truths about the North End community that put me in mind of Sherman Alexie’s collection Ten Little Indians — Phoenix is a tragic figure driven to violence by the direst of circumstances. Truth­telling takes heart and courage, and when violence has had a multi­generational impact, we need our storytellers more than ever. According to her Kookom (grandmother), Stella should take on that mantle. Can storytelling break the cycle of violence? KV: I’m glad the strength comes through. That, for me, was the most important part. It's what got me through the writing of this. My made­up sisters and their incredible resilience and love. In Lee Maracle's Celia's Song, Mink — the shapeshifter/witness — says, "The stories that really need to be told are those that shake the very soul of you." Storytelling has a role. Fictionalization of fact has a role, too. But the cycle is big and overwhelming and only broken when children are safe and loved, and everyone — men, women, two­spirited persons, elders — is honoured and respected. I think Stella is, as her Kookom calls it, a story keeper, someone who collects stories, but Stella is not a very empowered person. These stories debilitate her, keep her sad and unable to deal with, well, anything. This is an effect of trauma, too. Different people react differently. Someone like, say, Rita would have reacted to the situation of witnessing very differently. Rita wouldn't have stood there frozen with fear; she would have had the power to react. I love Rita. CFG: That’s interesting. Stella didn’t have the power to act in that moment, but she had the courage to strike out on her own, first when she went to university and then when she married outside her community. Those things make her not quite an outsider, but an estranged family member — she’s the one who left, while the others stayed. This is a theme that’s very much alive in Elena Ferrante’s Neapolitan novels. Do you see Stella as courageous in that way? How does the distance from family and community affect her? KV: I don't really see Stella's moving away as courageous. More so, it felt like she was responding to the trauma of her childhood by running away. Not staying in touch with her family was an extension of that and it weakens her, I think. She rejects her family, insults and hurts her grandmother and it doesn't help her. She is an emotional wreck, really, incapable of helping herself and others. But I'm hard on Stella, I know. Lou and Paul are also educated and married out of their community — "city half breeds" and "real Indians" are colloquial for urban Métis and rural Status Indigenous persons, very different groups. Cheryl, too, is accomplished and did move away for a time as well. There are differences between all of these, of course, but I don't think I would call Stella's actions brave. CFG: They’re all wonderfully subtle characters with complex motivations. Lou comments on that sense of in­betweenness felt by the urban Métis. “A real house in a real community with a real family,” she says. “Real Indians! Not city half breeds like us.” What do you think she’d say about the new ruling by the Supreme court, that the Métis are now considered Indians* under the Constitution? Would it shift that sense of psychic homelessness for her, do you think? *Even though “Indigenous” is more correct, “Indian” is a constitutional artifact and still used in that context. KV: Well, I know for myself, it felt very validating to be acknowledged for being a part of a larger group we were purposely excluded from, but it's only a ruling. It's a good step in the right direction, but there is over a century of impositions and injustices to unpack there. And, as much as all Indigenous nations have common threads, relatives and ground, it's very important to recognize our individual nationhood. Métis is its own culture. It is distinct and diverse in and of itself. We've often suffered from a "not enough" complex, and I think that might be what Lou is alluding to here. CFG: We can see another dimension of that “not enough” complex in Tommy, the Métis cop investigating the crime with his non-Indigenous partner. He’s a character straddling two worlds and often feels that conflict. Looked at that way, his decision to go into law enforcement is heroic. It’s not just a job for him, is it? KV: I've always been sort of intrigued by Indigenous people who join law enforcement. As a younger person, I only saw contention between the two groups, so it seemed like it would involve a lot of issues. Of course, that experience, my experience, is not universal. As an adult, I have met several officers who have taken on their job and community membership so admirably and have a certain belief in the system that I kind of envy. That's how I framed Tommy, anyway. He really wants to be a hero, and to make the world right. Reality has made him waver a bit, but he does try, in his way. CFG: He really does want to make a difference, but he’s always caught between worlds. The community doesn’t completely trust him, and he puts up with a lot from his partner. When Emily’s attacker is still unknown and Lou’s new boyfriend comes under suspicion, Cheryl says, “Not everyone is a monster.” That theme of trust — who can be trusted, who can’t — is reflected in various ways throughout the novel. Who did you trust as you wrote this novel? Was there anyone besides Lee Maracle who inspired or guided you, whose work you returned to as a polestar? Who are you reading now? KV: Trust is a big theme, isn't it? I think that might be one of the worst results of trauma — when you can't trust. I had and have a beautiful circle of trust, of women, my mother, my best friends, my daughters who always teach me something. I do have a strong partner, Reuben, who really saw me through a lot of this stuff. My father, my brother, too, are great supports for me. My dog — I mean really, I can't tell you how much my dog heals me. He always needed a walk when I was really stuck and worried about something in the book. Who am I reading? This year I've been reading almost exclusively women, Madeleine Thien, Lee, Kathleen Winter, finally got to Ann Marie Macdonald's new one recently. I was reading a lot of Toni Morrison while in the last edits of the book. I don't recommend that; it made me feel wholly inadequate. On the flip side, I'm also a huge fantasy fan — anything with sword fighting and/or dragons — and I anxiously wait for anything George R.R. Martin puts out. CFG: As you wrote, did you have an ideal reader in mind? Who do you hope will read this novel? KV: I don't really have an ideal reader. I know when I was writing I was thinking about other Indigenous, inner city women. Those from my city specifically, and Métis and Anishinaabe, like the characters. I want them to feel as accurately portrayed as possible. Those who have experienced similar traumas. Of course not everyone reacts the same way, but as long as that felt authentic then I feel like I've done my job. CFG: It’s a very moving novel. Cheryl, who is involved with young artists, muses on that desire to get it right. She says she “remembers that feeling, that fear of what people will think of you and your art, your whole spirit up there, out there.” How do you feel about this contract on the eve of the publication of your second book? Does it become any easier? KV: It doesn't get any easier, no. I think it just gets different every time. I thought it would be easier because it's fiction, but even the made up stuff has a way of sneaking truth into it. That, and I haven't quite figured out a way not to rip myself wide open when I write these things. I don't think there is a way to do it half­arsed. It's heavy stuff and I have to be there to witness it, embody it, over and over. I think this is the least I can do for the characters and all they represent. Sometimes it's the only thing. Editor's Note: The Break has been nominated for the 2016 Writers' Trust Fiction Award. Christine Fischer Guy’s debut novel is The Umbrella Mender. Her short fiction has appeared in Canadian and US journals and has been nominated for the Journey and Pushcart prizes. She’s a fiction critic for The Globe and Mail and contributes to Ryeberg.com, themillions.com, Hazlitt and The Los Angeles Review of Books.